Howdy again beauties! Gosh, do I have an exciting post for you today, haha; well, for me at least! Now, I'm not calling myself fat before any of you pounce on me, but, I could never be a model. However, my unfulfilled dream of modelling came true recently! 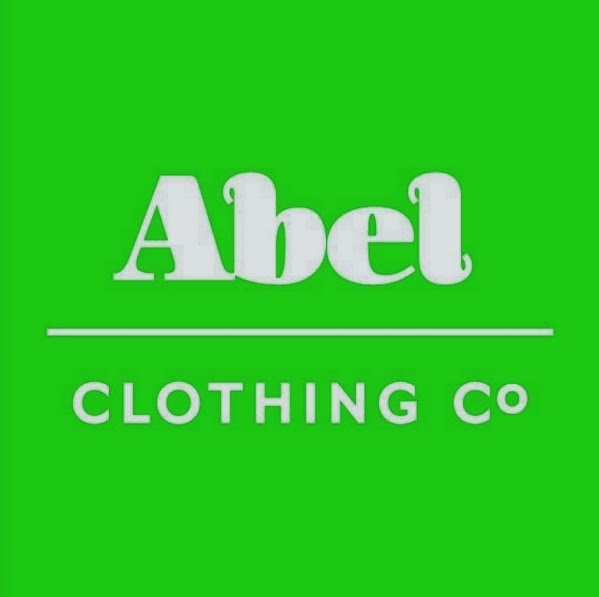 One of my best friends Hannah Abel is the founder of an incredible brand called Abel Clothing Co. She is super talented and so creative! She has created a line of gorgeous hand made dresses which she designs and creates herself. Her business is now growing exponentially & I couldn't be more proud of her, nor more delighted that she asked me to model in her Spring collection! Exciting stuff, right!? I'm so in love with this photo. Our amazing photographer, Kirsty from BeanFlavouredSoup, captured some amazing, fun, pictures throughout the shoot. Now, as you can see, I'm plonked in the middle there having a whale of a time! This vintage green dress is so beautiful and super comfy to wear. I love the length of the dress as it hides a multitude of sins. I felt so sassy and fabulous in this dress as you can probably tell, haha! 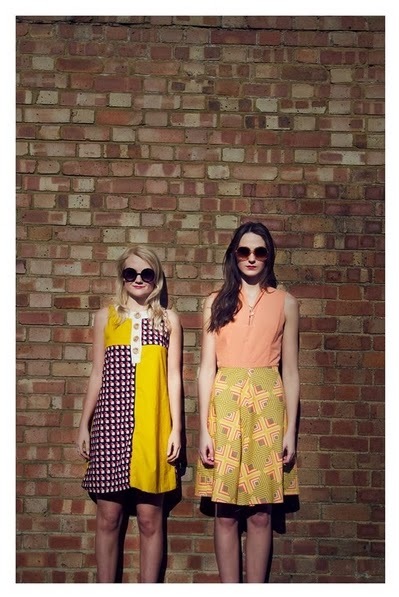 Our 60's sunglasses also made us feel like we were in Vogue. Ya know, as you do... The beautiful Hannah herself is there on the left and the lovely Meg is also strutting her stuff on my right, each in Hannah's amazing garments and obviously loving life! Now, Hans and I are such great friends and I met her almost 4 years ago now on my induction day at my new sixth form where she was so lovely and welcoming in my A Level Dance Taster Session. When I started in the September we hit it off straight away and she's always been there ever since. I love her to bits as you can see in these two shots above. I love that our friendship comes through in the pics; I love that Hannah's vision for the shoot was purely to be FUN and relaxed! We're not just great actresses - we really are that great friends haha! These two looks were super fun to model. Hannah looks stunning in her blue patterned tie-neck dress which is perfect for the up-coming (fingers-crossed) hot weather! My dress in the picture to the right was one of my favourites! I love the way it sits on me and is so flattering even though it isn't fitted. The colours are so fun and really compliment my blondness. LOVE IT!! We had SUCH a giggle taking this shot. We were walking up and down, up and down saying "this is so awkward", "this is not working" haha, but actually we got a great shot!! One thing Hannah really wanted for the shoot was a really run-down, rugged, vintage-looking background to contrast and exaggerate her gorgeous, colourful pieces. I think this worked so well! It's so effective & highlights the beauty of her dresses. I couldn't have loved this shoot more & felt so privileged to be a part of it and get to model Hannah's incredible work. We're shooting again in June time for her Summer collection & I'm so excited! 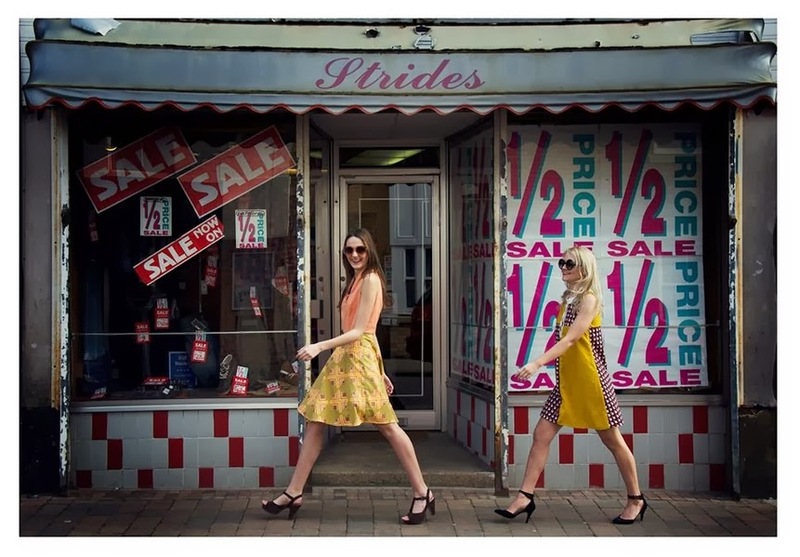 Let me know what you think to the dresses and our fun shoot. Hello again my lovelies! So, I am loving this 'Vlogging' business - I love how personal it is and I actually get to TALK to you lovely bloggers now. Just to let you know, I will be writing posts with just writing and piccies so don't worry, this page will not be bombarded with videos, hehe. I seem to have an issue in my videos so far; over-using a certain word. My last video was 'fabulous' and this video features the word 'amazing' FAR too many times so I apologise for that, haha! Share with me YOUR favourite beauty products and, like I said, be sure to let me know if you want me to try any of your favourites out and don't be shy, speak up and tell me if you think there is a better product out there for me!! At the moment I'm noticing a huge trend on the blogasphere to do with food; what's good for you, what's not, how to lose weight, how to gain weight, how to feel great, what us bloggers like to munch on... LOADS. Now, I love my food. When I say 'love' I mean ridiculously adore on the highest level possible. I'm a food addict. 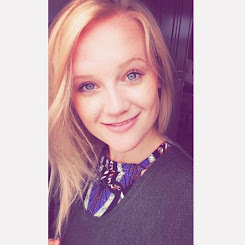 However, I have really changed my attitude towards food in the past few months with the help of my boyfriend who is a Personal Trainer in the Army (You can check out his blog here...). He's a clever sausage. The greatest myth there is in all this 'fad' and radical diet changes is the perception that you must eat less to lose more. WRONG WRONG WRONG. If you eat the right things and LOTS of it, you'll be on the road to your dream health and physique. But, you must never see your eating habits as a 'diet' but as a 'lifestyle'. The results, health and overall happiness I have found are incredible and as a beauty blogger, I want to make you all feel beautiful. Even though you already are, feeling and optimizing your beauty and confidence is what life is all about! I'm going to walk you through some of my favourite meals and snacks which are packed with nutrients and natural goodness and fill me up and keep my taste buds happy!! This is beautiful, isn't it... And, would you believe, so ridiculously good for you. Here you see the beautiful banana omelette stack. No flour. Perfect pancakes. All I put in these are mashes bananas, eggs, a splash of almond milk, a few oats and drizzle honey on top. I can't even tell you how good they are, just make them and see. This sets me up perfectly for the day with a hit of protein and energy releasing carbs which wont cause me to store fat (no refined sugar like cereals bars or sugary breakfast cereals). 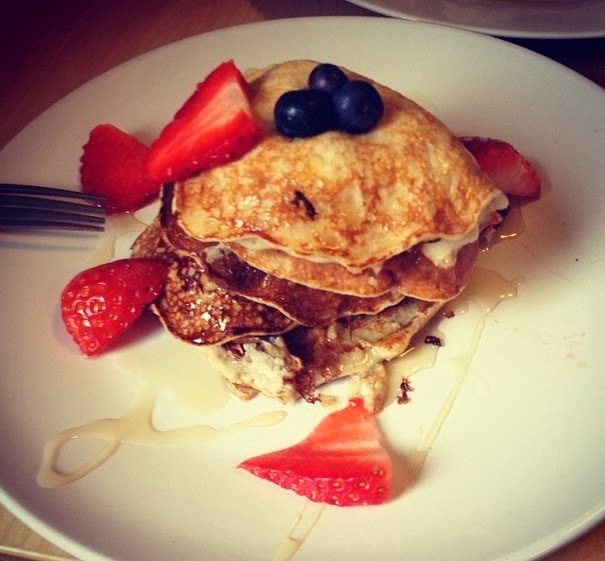 Get your flippin' frying pan out and make these bad boys. I'm a pretty active person in the day and teach dance at the moment so most days I put myself a lovely salad together. Now the word 'salad' is very often welcomed with a yawn... However!!! I now, sadly, find salads can be easily made more exciting. It's the attitude you have towards your food that makes it satisfying. My favourite salad is a Tuna Fish and Boiled Egg salad with cucumber, sweetcorn, carrots, peppers and lettuce. I also find that the more colourful your food is, the more you'll enjoy it. I love the process of making my food and enjoying it afterwards. The fantastic thing about natural foods is you can't really over size your portions, just go for it! Whack all those nutrients down you! Now, I have two choices here which I can't really decide between. I LOVE dinner. It's my favourite meal of the day and I genuinely get excited about it. 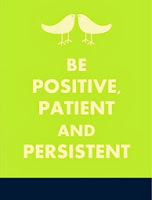 It gets me through the toughest of days, haha. Wow, Abbie... Just, wow... 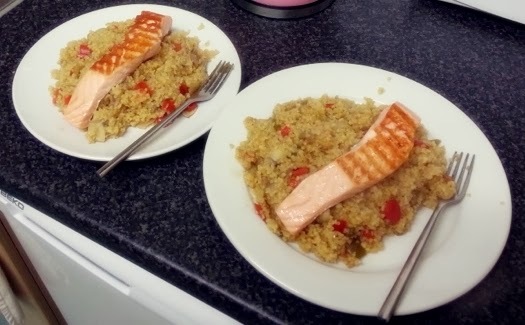 Anyway, firstly I'll introduce you to the gorgeous Salmon and Bulgar Wheat Risotto. This dish is gorgeous and packed with protein rather than the carbohydrates you'd get in a rice risotto. Bulgar Wheat is an amazing ingredient to use in your cooking. It's a grain which fills you up without dumping a tonne of carbs on your system in the evening. 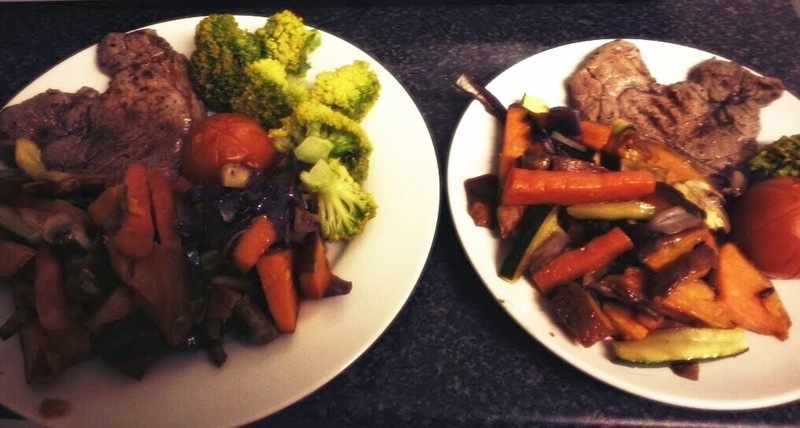 Another meal I adore is steak and roasted veg. Oh heaven. I like my steak medium rare as I think this keeps in a load of flavour and texture. These roasted veg are honey glazed to satisfy my sweet tooth in a healthy way. Popped in that mix of veggies are Sweet Potato Wedges, Carrots, Mushrooms, Red Onion, Courgettes & Tomatoes. My boyfriend can't seem to function without the addition of broccoli, haha, so that's bunged on there too. I seasoned the steaks with a mix of sage, thyme, a splash of Worcester sauce, salt & pepper. De-freakin'-licious. Believe me. The fantastic thing about all of these meals is they are completely guilt-free and purely fuel for your body! During the day, in-between meals, it's actually really good for you to snack. Not bad stuff, but good food to keep fuelling your body. You must start to think of your body as a machine that needs fuel rather than a centre of cravings run on sugar... Just change the way you think. It's as simple as that. Snacking will help you do this, fight those hunger pangs! I snack on all sorts of food. 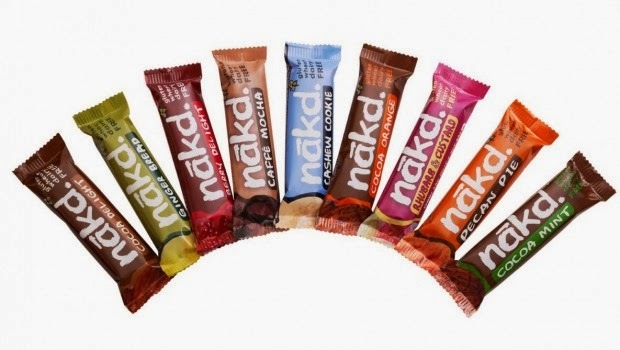 My main snacks consist of Dried Mango, Nuts with dried fruit such as cranberries and I also love Nakd bars!! They are packed with cold-pressed fruit and nuts such as dates, cashews, raisins and flavoured with natural cocoa and flavourings from oranges, bananas, strawberries etc. So delicious and so nutritious. It's really not easy to drastically change your eating habits and you really don't need to. Try cutting out little things at a time and substituting them for other, yummy, alternatives like white bread to freshly-made wholegrain bread OR Coca Cola to Green Tea or Water with freshly-squeezed Lemon Juice. One thing to remember is nutrition and fitness is all about 70% the food you eat and 30% the activity/ exercise you do. It's so important to eat well! 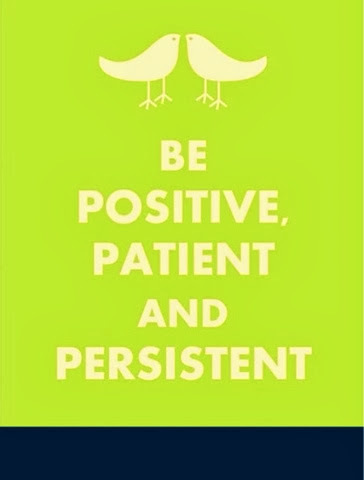 You can do this & you are beautiful. 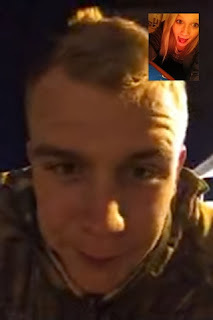 Firstly, the start of the year saw a new challenge for me with my boyfriend in Afghanistan over X-mas and New Year which was a massive challenge but incredibly life-changing. Someone you love being away at such a special time of year really shifts your perception of what the holiday season is all about - love & family!! Now, I run a blog about Beauty and all that jazz so I guess I come across as quite materialistic sometimes but I assure you, this year especially, I didn't want any presents. I just wanted my loved ones surrounding me. It's amazing how much we take for granted until it's gone and this is something I want to carry on practising throughout the year and for many years to come!! Having said that hahahah... I have also been working super hard for my quest to get into drama school. This is now my second year auditioning (I tell you - it's no bloomin' walk on the park!!). Let me break it down for you.. I'm auditioning for roughly 7 schools and each school has on average 2,500 applicants for 30 places (normally 15 girls, 15 boys). That equates to about 1% of all applicants actually get anywhere. MADNESS I TELL YOU!! But, when you truly want something and your passion drives your every move, you'll never give up. No matter what your passion is - DO NOT GIVE UP!! On a lighter note, I have made some FABULOUS buys already this year from the famous Models Own 50% off sale, mostly, haha! That sale was literally heaven for me... I can't even... Anyway!! Ooooooh this makes me so happy hahah. 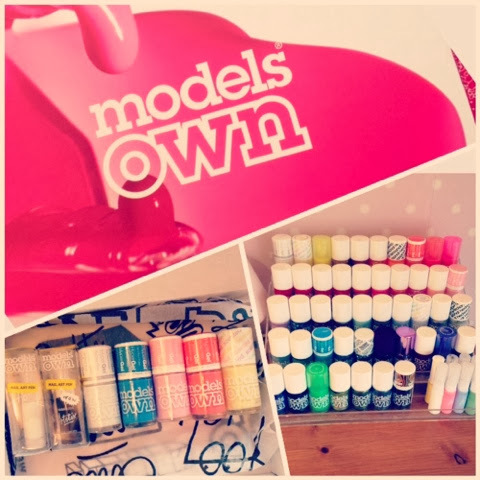 I limited myself MASSIVELY... Models Own new HyperGel collection is to die for. 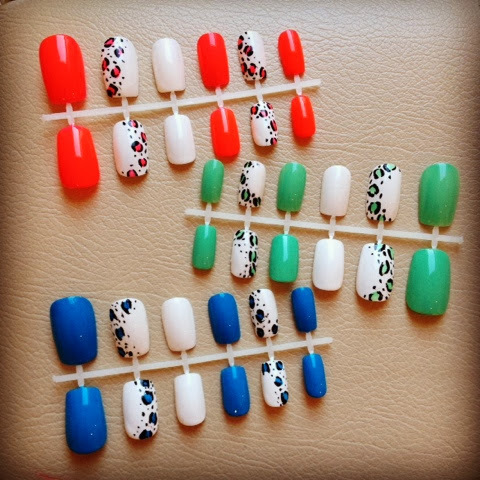 The glossy, sheen effect that just ONE coat of this beautiful stuff achieves is what every nail art lover is craving. That gel effect without UV or a £30 Shallac! 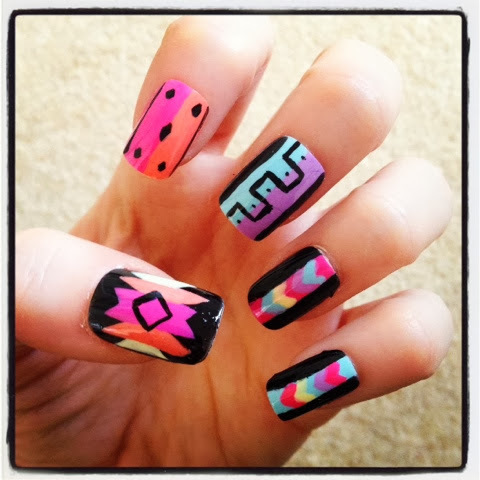 Heaveeeennnn :) I also whacked in a Banana scented yellow polish and two more nail art pens as I've exhausted my other white & black with my recent designs... Check these out!! I hope your 2014 has started off with a bang and the rest of the year is one big happy fest! I know what you're thinking... Where have you been!?! 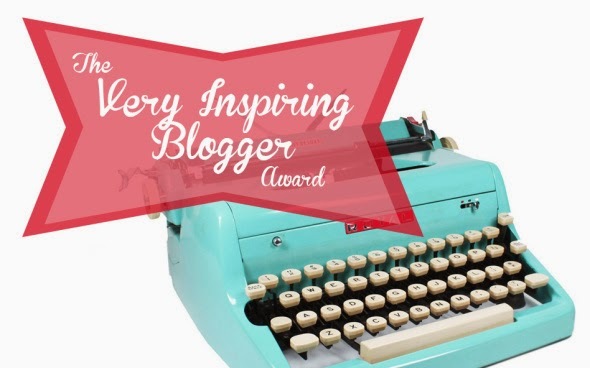 Well, I'm really sorry I have abandoned my lovely blogging community since OCTOBER! Disgraceful. 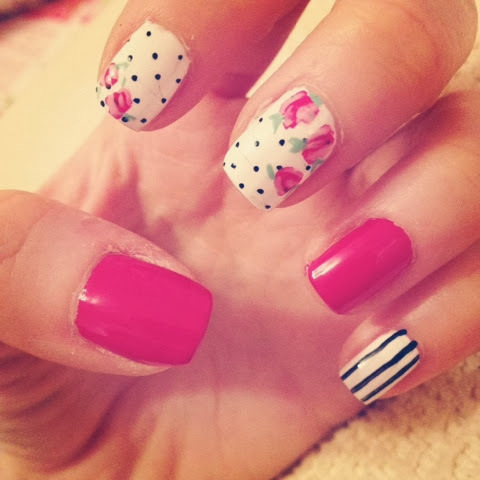 There are no excuses but I have been hectic setting up my Nail Art business (check it out) and letting life get the better of me. But, good news, I'm back folks and I couldn't be happier to be, once again, sharing my loves in life with you lovely lot! For my first post back I'm going to share with you my Dream Make-Up Collection which, if I had money to burn, I would collate and form the most perfect collection of products for a flawless face! First and foremost, I have been a lucky girl recently and, on a lovely recent weekend away to Birmingham, my wonderful boyfriend treated me to this beauty! 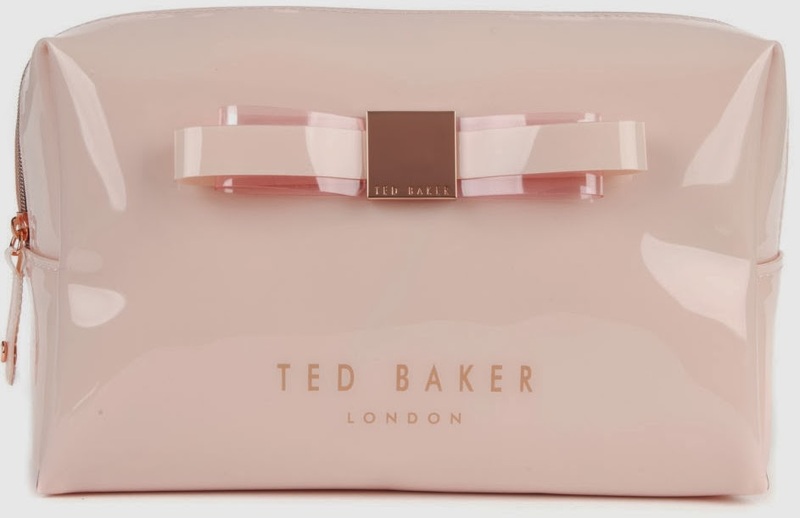 That's right, Abs is now carrying around this gorgeous Ted Baker Make-Up Bag in her handbag wherever she goes... Hehe. I love it! It's so ridiculously me it's untrue. The perfect pastel pink and so spacious I've struggled to fill it, can you believe! Well this little beauty has received some incredible reviews and awards in the beauty industry. Smashbox is HUGE in Hollywood as it's products leave 'Photo Finish' perfection. For roughly £25.00 is it worth spending this much on a primer which just acts as a base for your complexion. That's one costly base if you ask me but then again, if money was no object, this product gets the results! With added blemish control I'm all over this bad boy... Be mine!! 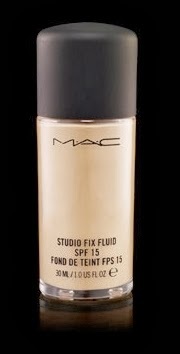 To pop on top of this perfect primer would be the fabulous M.A.C £21.50 Studio Fix Fluid SPF 15, how I wish!! This modern foundation combines a natural matte finish and a medium-buildable coverage with an SPF of 15. This foundation is said to be comfortable and long-wearing, lasting for up to eight hours. It also contains specially treated micronized pigments and soft-focus powders for a super-smooth look that helps minimize the appearance of imperfections - which I have a lot of, haha! For £21.50 I think this is reasonable to be honest! I need this in my life!! As for concealer, I always RAVE about Collection 2000's amazing Lasting Perfection concealer... I WOULD NEVER CHANGE THIS. I love it far too much... 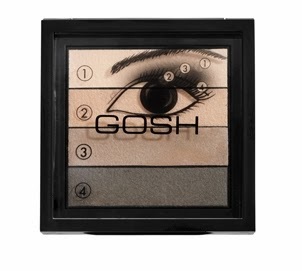 So, onwards and upwards... An essential to my Make-Up Kit is a fantastic colour palette for my eyes and this GOSH palette is gorgeous and contains the perfect shades for my light, fair & blonde skin tone and complexion. For £7.99 you get this fab little set of colours to blend to create the smoky eye look on the front of the packaging - I love that they give you a guide to colour placement - lovely little touch! Some days I just like to pop on a really pale beige over my lid to give a fresh faced, wide-eyed, relaxed look. I prefer wearing less and maintaining a natural glow, if I can! These fabulous four are the perfect start to a dream make-up collection to start you off on finding your flawless finish... Totting up the cost of this lot would reach £71.99... Ouch. Am I being stingy? Maybe I am... Hehe... One day I will collate my perfect collection and be wonderfully photo finish every day of the year! !